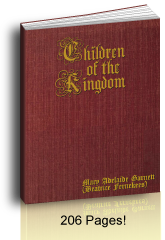 Between 1963 and the 1990s Catholic Book Publishing Company removed the beautiful Crucifix and tabernacle at the Consecration on page 48 of this Catholic Sunday school book. It remains missing in 2012. The New Saint Joseph Catholic Sunday school series is a darling Catholic catechism for children, yet here are some considerations you want to know. This page is the second of three articles that compare NSJ Baltimore Catechism series changes. On this page you'll see ten photos that show revisions from 1963 through 2012. At the end I suggest several good alternatives. Enjoy! 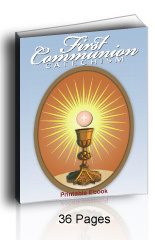 The NSJ Communion Catechism (NSJFCC) is the most popular booklet for Catholic Sunday school lessons. It is widely available and has been in publication for over fifty years. It has many lovely pictures and some very good ideas. It is divided into eleven lessons that children can learn in eleven weeks depending on how much time they have. Each lesson has two to six questions and answers based on the Baltimore Catechism. This is perfect for one week's classes. Add a week or two at the beginning to teach the Catholic Communion prayers for children. The Rosary prayers and the Act of Contrition for going to Confession are the main prayers children need to learn. They can learn them pretty easily with review if you say the prayers together at the beginning and end of each class, especially daily. Praying the family Rosary is the best way for kids to learn these prayers. It is important that Catholic children go to Confession before their First Holy Communion so that they can receive Jesus with pure hearts and minds. During the mid-1990s when we were first teaching our children about Communion, I had noticed that certain pictures had items missing from the altar at Mass. Through the years as my family moved, and later when my parents died, I received the other two booklets. I was amazed to find that the removals were successive, meaning that through the years more and more images had been removed from the pictures by the publisher, Catholic Book Publishing Company. Few teachers and parents would have noticed the changes as the covers were the same, the dates were the same and the changes were sprinkled throughout the books. If you have an older copy than your students, you may want to check that they have the same information. 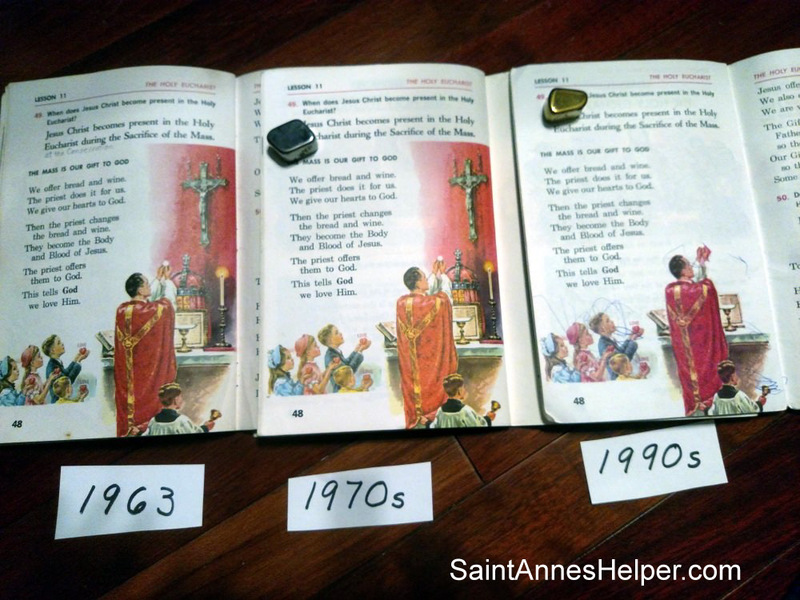 When I used the 1990s Catholic Book Publishing Company catechism myself, I thought it odd that a booklet that said that it was published in 1963 would have items missing from the altar that in 60s would have been required on the altar. As in the photo above, on page 54 the tabernacle and the Crucifix were missing on the altar diagram, yet they were still listed as numbers six and seven in text below the diagram. We also noticed the omissions because we had started attending the old Mass and, at the time, I simply drew the tabernacle and the Crucifix in place for our children to see. A couple years later, it was fun to show the children that the earlier booklets had indeed had the Crucifix and tabernacle in the original altar diagram. How was I certain that these things were supposed to be on the altar? Over ten years after I first used the NSJFCC for Sunday school and when I had had three books to compare at the same time; I could see the successive changes in the catechism at-a-glance, since I could put the booklets open side by side. Using due diligence I looked in the front pages to see what years these several books were published. I was surprised to find that they all had the same publishing date, 1963. +Francis Cardinal Spellman, New York, gave his Imprimatur and it remains in all three booklets and is maintained in 2012 even though he died forty five years earlier in 1967. How are these changes not marked? Copyright law does not require that minor omissions or revisions be noted in new editions of books, so it is common that newer books do not note revisions. Actually, it makes sense for such as misspellings and other little revisions; yet on matters of faith and morals, omissions, revisions and purposeful removals can be dangerous. If the first three had the same printing dates, how did I know which book had been printed first? Easy. I knew the children who had owned the books. As far as I know, they had all been in parish schools, so they would not have been in a Catholic Sunday school. I have known these people all my life. My brothers and sisters recognize them, too, and they are all still living. Throughout the last twenty or more years I recognized that other truths had been removed, altered, and rearranged. I began to see why in these omissions I hadn't known many doctrines that my parents had known and this was in spite of sixteen years of "Catholic" education and reading many "Catholic" books. I began to see why people my age didn't know basic Catholic religious truths like the Resurrection. I also began to see why teachers and parents did not understand why their students and children did not learn what they themselves had been taught, or believe as they had believed. 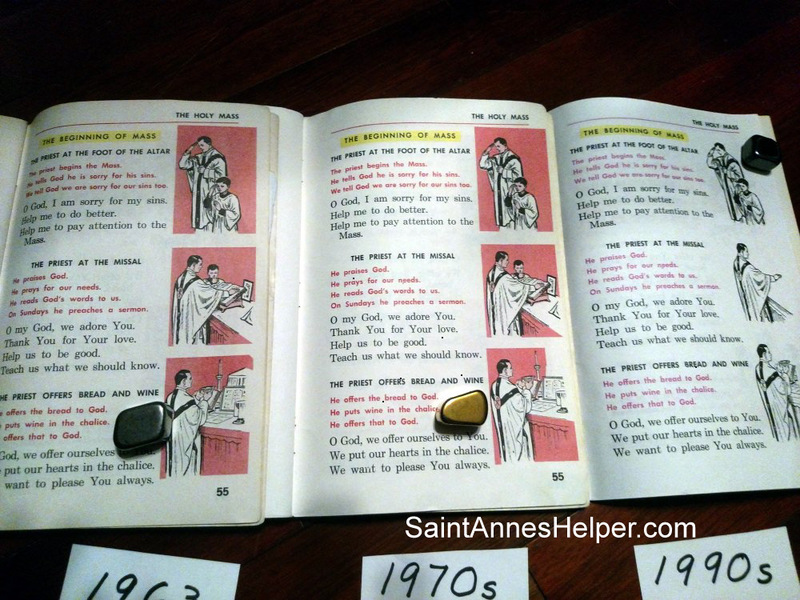 The books were different in ways that were hard for priests, teachers, and parents to notice, especially if they had kept their original booklets while the students received new versions. During the last 15 years I have shown many of my friends the differences in these three booklets. It was easier to show them the differences with the actual books than to describe the changes in conversation. When I showed them the books, they could see in one look the purposeful removal of items. Compared to the technology we have today, these omissions look silly; they look like the publishers had used Post-it notes and Wite-Out. In some pictures the priest looks strange with his hands stretched over nothing. I placed the booklets together with all three books side by side with their dates in order. I do the same for you in photos below, and I'll explain what I've seen. This will give you an easy view of some of what's missing, and a web page to share when you try to explain these changes to others. The picture on the left will have the older booklet from the 1960s, the middle one will have the 1970s booklet, and the booklet on the right will have the newest book. Otherwise, the oldest book is on your left and the newer book is on the right. That way you'll see them in chronological order, if you want to compare the catechisms. 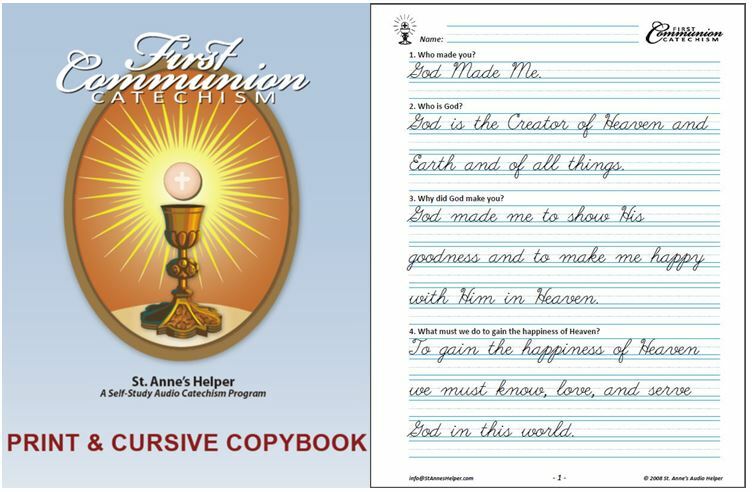 If you've seen enough and are looking for a good Catholic Sunday school Communion catechism, I recommend our Saint Anne's Helper booklet, worksheets, and recordings. The original 1963 New Saint Joseph First Communion Catechism page 16 shows the Blessed Trinity with the Son at the top. Holy Ghost is changed to Holy Spirit. Just a heads-up: This may seem like a sniggling item, yet years ago a catechist had thought it was important and had even called to ask, "Hey, what's up? Isn't the Father usually on the top of the triangle that shows the Blessed Trinity?" Hm…. Yes, I hadn't caught that. This arrangement may make it seem as if the Son is more important than the Father. Or whatever. This runs in all four booklets. This picture from the original 1963 New Saint Joseph FCC page 16 shows the Blessed Trinity where the Son is at the top. Usually the Father is seen at the top in an equilateral triad with the Son on the left and the Holy Ghost on the right. Holy Ghost is newly reprinted as Holy Spirit on this page and in many places in 2012. The beautiful 1960s picture of the Consecration on page 48 of Catholic Book Publishing Company's Communion Catechism was removed by the 1990s. See the top picture on this page. What a heart breaking edit. Other images like this are called Mysterium Fidei. It is so sad to see that the very Mystery of our Faith is gone. The Catholic tabernacle, Crucifix, and candles are removed by the mid 1990s and the altar card stands up by itself. Also question 49 on page 48 offers a good opportunity to teach that Jesus Christ becomes present in the Holy Eucharist during the Sacrifice of the Mass. I like to add "at the Consecration". It's a simple phrase to add and since pastors frequently ask this question, you'll get a lot of miles for your effort with this addition. You can be more explicit by teaching that "The priest changes the bread and wine into the Body and Blood of Jesus at the Consecration." Even though it's not in most Catholic Sunday school catechisms, many pastors do ask the children what the white host is before and after the Consecration. It's the main truth children need to know, that Jesus is present; so it's good to teach that the host is bread before and It is Jesus after the Consecration. I like to write this phrase in my books so that I remember throughout the years. I have a fifth copy that has written notes that I do not show here. Further, the title on page 48 "The Mass is our gift to God" is not a definition. In brief, point out that the Mass is a sacrifice…. 60. What is the Mass? On page 53 the picture of Jesus as priest facing the congregation in 2012 is the same as it was in 1963 when the priest did not face the congregation at the Consecration. It is a lovely image of His sacrifice in promise at the Last Supper, in reality on Calvary, and sacramentally in the Mass; yet it was an unusual image to show in 1963 before the 1969 Mass changes. Children love when you explain the heartening stories involved in this picture. Here you can see the progression where Catholic Book Publishing Company removed images from the NSJFCC on page 55. By the 1970s it removed the tabernacle from the bottom picture. By the 1990s it had also removed the Missal and altar cards. These remain missing in 2012. The Catholic Crucifix is a symbol of the Catholic Faith. These are hugely important to have at the altar and we try to cover such symbols in Catholic Sunday school. The children are often eager to know the symbols as they like pictures of ideas. Normally in history you could find the tabernacle centered on the altar in a Catholic church. It is a symbol of the meaning of the Mass as it is where Jesus resides in the Blessed Sacrament between Masses. Catholic Book Publishing Company removed images from the NSJFCC on page 55. Progressively, you can see that by the 1970s the tabernacle has been removed at the Elevation of the Host on page 56. By the 1970s you can see that the tabernacle has been removed at the Elevation of the Host on page 56. The next picture shows what happened to this Catholic Sunday school booklet twenty years later. 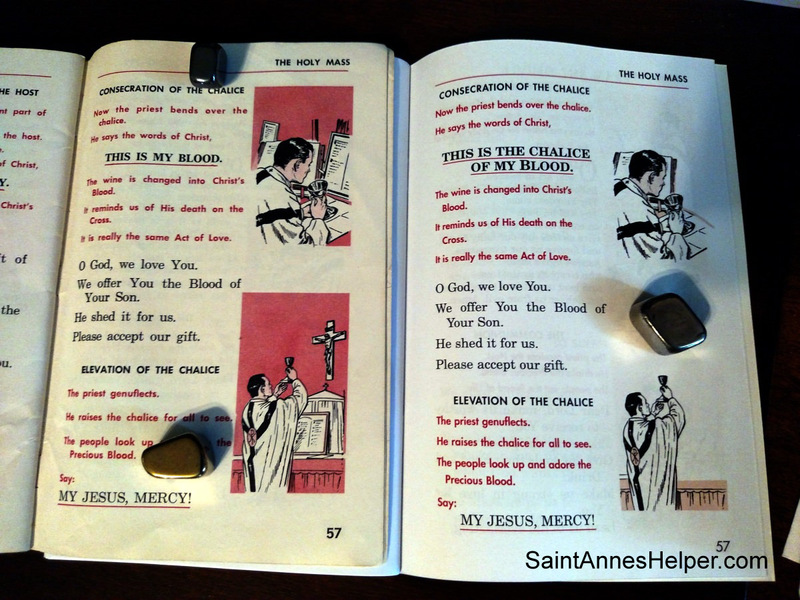 The third booklet on the right shows lots of white space around the priest and altar…. The following picture shows the same pages as the photo above, yet in this spread you can see at a glance how many altar pieces had been successively removed by Catholic Book Publishing Company during the 1990s. More altar vessels are missing from the altar in the NSJFCC by the 1990s. THIS IS THE CHALICE OF MY BLOOD. This is closer to the words of the Consecration, yet I wonder why they bothered to change it. I would think that Catholic Sunday school teachers would have complained one way or the other. More words and pictures are changed. The following photo shows the Latin dialog responses on page 59 that were removed by the 1970s and 1990s. These dialog responses are not all the altar server responses. The Judica Me, Confiteor, and Suscipe Sanctae Pater were not included. There were Dialogue Mass revisions through many years during the mid-1900s and it was rare in the USA through the 1960s. Either way, Latin has been generally suppressed since the 1970s. 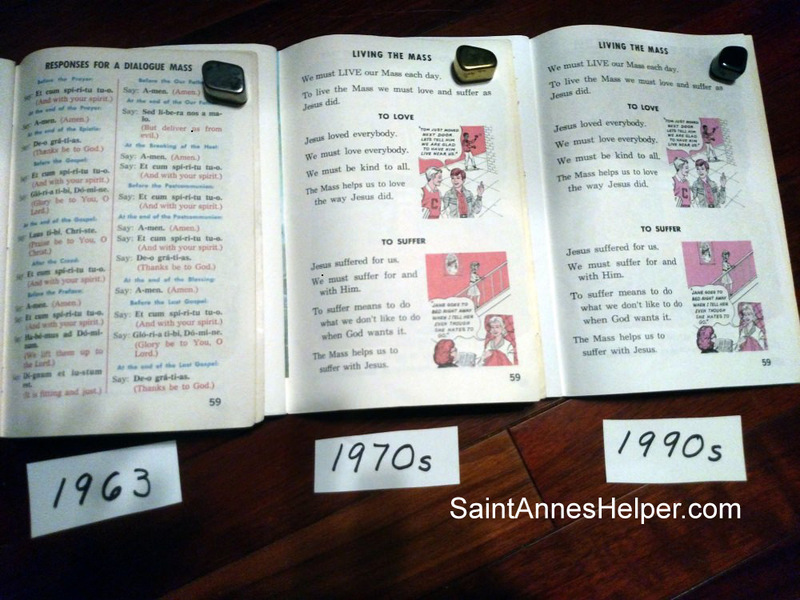 New Saint Joseph Sunday School Lessons taught some altar server responses in 1963. The next photo shows what replaced the Dialogue Mass responses. 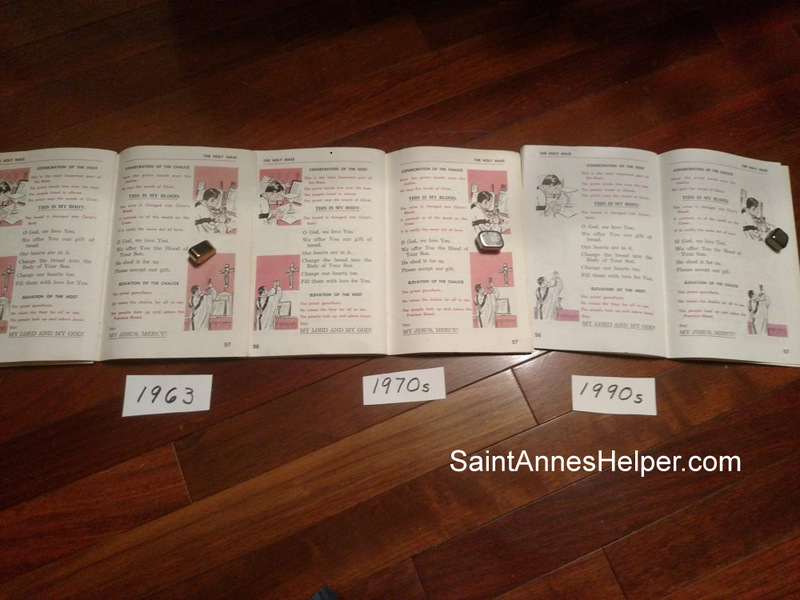 It shows several versions of page 59 in the New Saint Joseph. On the left hand page is the Responses For A Dialogue Mass and the other two pages show the new material. 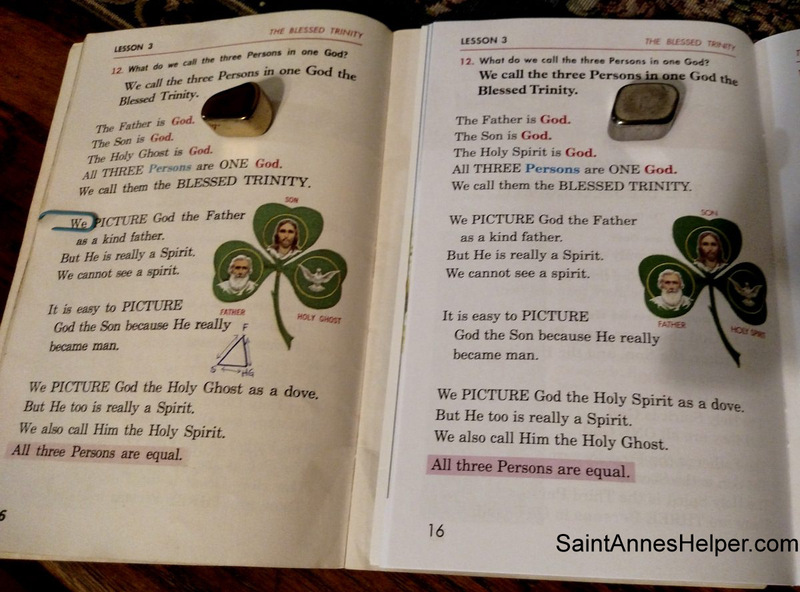 The New Saint Joseph Catechism on page 59 shows the old Responses For A Dialog Mass and the other two pages show the new material. 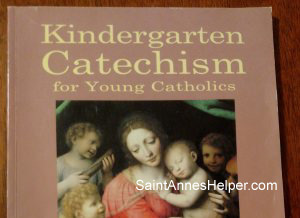 Kindergarten Catechism For Young Catholics by Seton Home Study is an improved alternative to the NSJFCC, as it removed some of the difficult passages about the Resurrection. 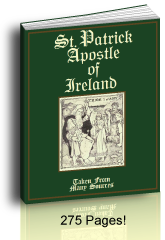 It has the singular version of a Penance question on page 41 as does the Our Holy Faith series Book Two Jesus Comes and Saint Anne's Helper Catechism. The 1950s Our Holy Faith corrected the plural confession answers from the original 1885 Baltimore Catechism. 33. What happens to those who die in mortal sin? Those who die in mortal sin are punished forever in the fire of hell. 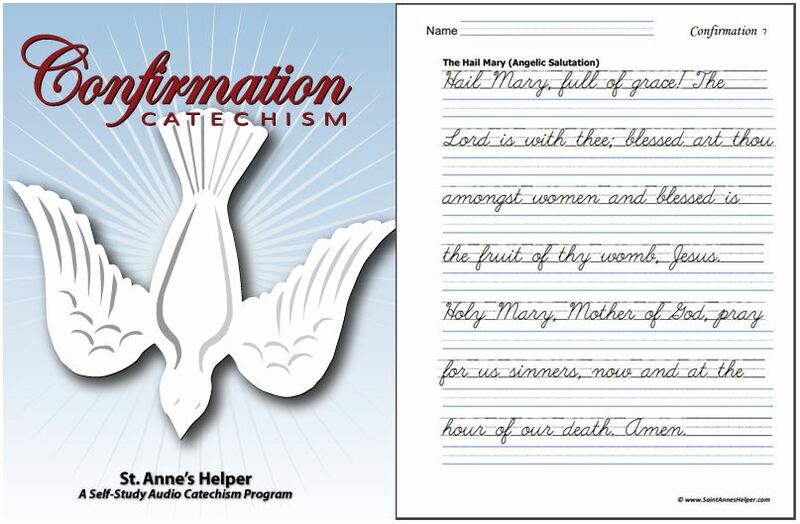 Both answers are included in Saint Anne's Helper downloads and Seton's revision. 49. When does Jesus Christ become present in the Holy Eucharist? Jesus Christ becomes present in the Holy Eucharist during the Sacrifice of the Mass [at the Consecration]. If you do not use this booklet, remember to teach that Jesus Christ becomes present in the Holy Eucharist during the Sacrifice of the Mass and specifically "at the Consecration". As above, one would think that the older 1963 NSJFCC book would be a very good Catholic Sunday school resource; yet I think you would want to know a dangerous wording about the Resurrection in the NSJFCC and the higher level NSJBC No. 1 and No. 2. It is important to teach beginning Catholics that Jesus Christ rose by His omnipotent power - as He said He would. This section will compare what Catholic Book Publishing Company printed and what The Catechism of the Council of Trent wrote so you can see how the Catholic Church has always taught this truth. I have actual references like these for you to use as a New Saint Joseph reference guide. "Now if Christ be preached, that he arose again from the dead…. And if Christ be not risen again, then is our preaching vain, and your faith is also vain." By the Resurrection, however, we are not merely to understand that Christ was raised from the dead: which happened to many others, but that He rose by His own power and virtue, a singular prerogative peculiar to Him alone…. This divine power, having never been separated, either from His body in the grave, or from His soul in hell, there existed a divine force both within the body, by which it could be again united to the soul, and within the soul, by which it could again return to the body. Thus He was able by His own power to return to life and rise from the dead…. Our Lord confirmed this by the divine testimony of his own mouth when He said: I lay down my life that I may take it again . . . and I have power to lay it down: and I have power to take it up again. [John x 17, 18].… as the Scripture testifies in the same place, he spoke of the temple of his body. We sometimes, it is true, read in Scripture that He was raised by the father; but this refers to Him as man, just as those passages on the other hand, which say that He rose by His own power relate to him as God. Our Lord came forth from the grave, alive and with a glorified Body, having risen from the dead by His own power…. This is followed by several explanations of how the Resurrection fulfills the prophecies, and it gives the Bible quotes and explanations on page 712, ff. Children love to learn, "See? God kept His promise!" Even the earliest NSJFCC that I own explicitly says that the Father raised Jesus on page 33. This confusion is repeated on page 49, and it is enlarged in the New Saint Joseph Baltimore Catechism No. 1 and No. 2 (which I discuss in part three of this article). On page 33 and 49 remember to teach that Easter and the Ascension were forty days apart. These events happened over a month away from each other. Jesus went home to Heaven to prepare a place for us on Ascension Thursday, forty days after the Resurrection on Easter Sunday. This association can help children remember the Ascension as a holy day of obligation throughout their lives. If you use the NSJFCC you will want to know that, because there are at least four different editions, students may have different wording and different pictures from what you are using. This can help you keep track of changes. The front cover has a new font. The inside front cover has a new picture where the girls do not have head coverings. P. 1 In 2013 the acknowledgment of Rev. Bennet Kelly is removed. P. 2 Holydays of Obligation is rewritten to be Holy Days of Obligation (holydays is split into two words) and there is new copyright information. See photos above. There is also a new picture in 2012 of Jesus with the children where the girls do not have hats or head coverings. P. 3 Newly in 2012 the term Holy Ghost is switched to Holy Spirit (pages 15, 16, 38, 64). P. 10 Has some really good lessons for children: knowing, loving, serving God. P. 14 It may not be important, yet in writing about the confessional the word BOX is removed. P. 24, 40, 47, 49, 64, etc. As through the whole book and series, there are places where the plural does not fit as with "our" soul which ought to be our souls as we all do not have one soul. (This might have been written by a religious who did not speak in the first person singular and can be confusing especially to children who have to go to Catholic Sunday school - they might not see the Faith through the week.) P. 26 has the plural and singular form. P. 28 The 2012 version rightly improves "Jesus was born on the first Christmas Day, more than two thousand years ago." from the "nineteen hundred years ago". P. 30 The CCD Bible version uses the unisex "one" rather than "man". P. 33 As per the the description below the picture, you will want to teach that Jesus rose from the dead and that the Ascension was forty days after Easter. The Gates of Heaven were not opened until Jesus ascended into Heaven. P. 36 Question #41 is a subjective question, "What did Baptism do for you?" rather than the definitive question "What is Baptism?" The question is poorly worded: "What does Baptism do for you?" It could be understood to be asking for a definitive answer, yet some children in class might answer it with subjective answers if they do not memorize the definition: "Baptism washed away original sin from my soul and made it rich in the grace of God." Good answer, lousy question. For one thing, Baptism does the same for everyone despite the incidental parties and gifts that are so different between families. P. 37 Question #42: The order of sacraments is changed to Penance, Holy Eucharist, and Confirmation (the order in which we usually receive them). P. 38 Question #43 is another subjective question, "What will Confirmation do for you?" Holy Ghost is changed to Holy Spirit in 2012. P. 40 Beware "our souls". The new Bible quote at the bottom of the page is not complete. It is also not the Douay-Rheims Bible version. P. 44 A prudent Catholic Sunday school note is added to the 1970, 1990, and 2012. "'This is my first Confession' need not be taught if there is danger that the children will continue to repeat it in subsequent Confessions." In my experience the likelihood is great. If you are the parent you can ask the child to memorize according to the schedule you keep or desire to keep: weekly or monthly confession. Children are very good at reminding us that it is time to go to confession again – once they know. Going to confession every two weeks means you can earn a plenary indulgence every day with the normal conditions. This way you have confession in line every eight days before and after the devotion. Monthly confession is an excellent habit for the First Friday devotions to the Sacred Heart and Our Lady of Fatima's First Saturday devotions to the Immaculate Heart of Mary. P. 49 There is a difficult passage here, "….the Father raised Jesus from the dead" as if the Father's action excluded Jesus' own action. P. 49 The next lines give the impression that it is easy to get to Heaven, which can be true and it is important that children love this truth. Do explain that we all have an obligation to go to Heaven and that we can get there if we will use the means that Jesus gave us. If we love Him, keep His Commandments, and love our neighbor as ourselves we can get to Heaven. Jesus loves us and wants us to go to Heaven. Be encouraging and let the children see your love of God by a cheerful voice and happy demeanor when reading Bible stories and saint stories. Show lovely pictures when you can. P. 51 The text here reflects the change in the Communion fast. 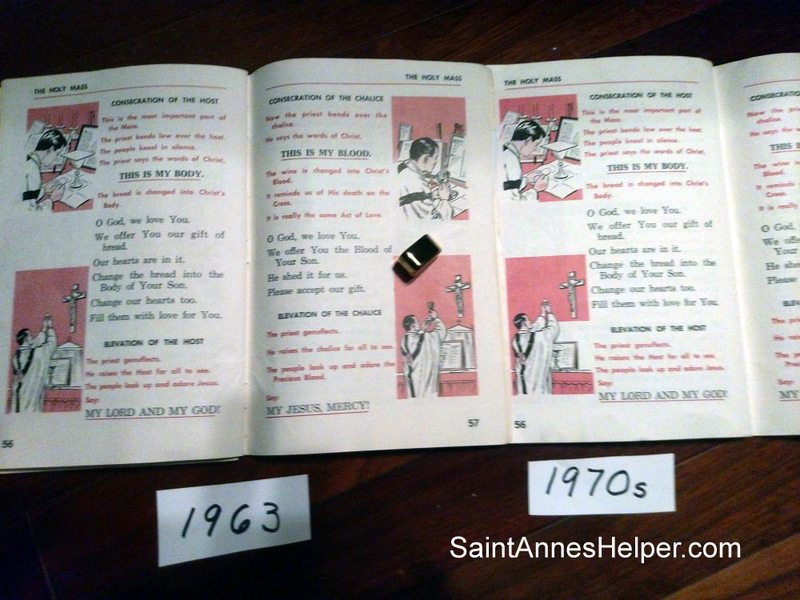 Originally the 1963 had had the permitted three hours (not the traditional "from midnight"), and the later booklets show the current "one hour before Communion". P. 53 Shows Jesus facing two ways, toward God and toward the congregation, as at the Last Supper with the Apostles and as consecrating priest at Mass. Children kneel at the Communion rail. P. 54 The altar diagram is greatly changed throughout the years, with new additions and different deletions. See the photos above. P. 55 The second subheading adds "AND AT THE LITURGY OF THE WORD" with the picture of a priest with his hands over nothing. The other two pictures do not have the tabernacle and Crucifix. P. 56 and 57 There are more Sunday school images deleted from the 1963 booklet and the words of Jesus at the Consecration are changed from "THIS IS MY BLOOD." to "THIS IS THE CHALICE OF MY BLOOD." which is closer to the traditional Consecration words. 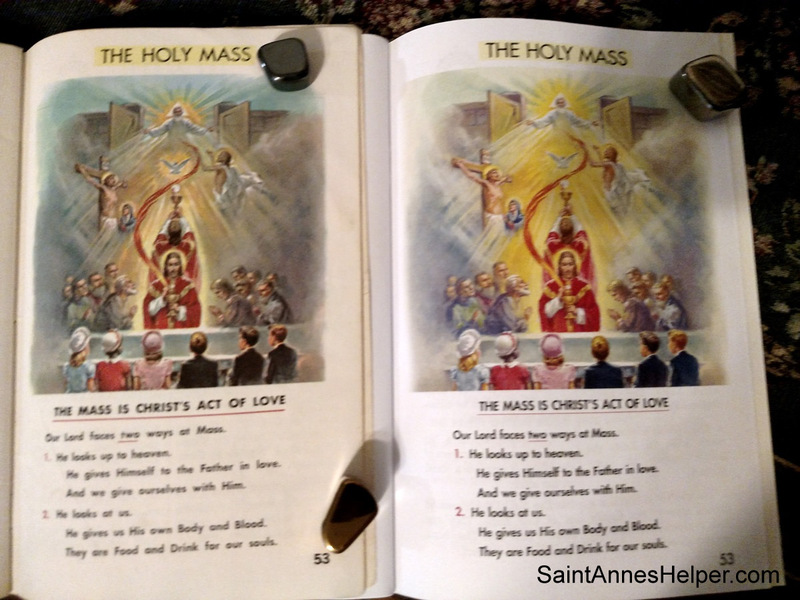 P. 58 A candle and altar card are removed from the top image. P. 59 The original 1963 Dialogue Mass Responses are changed to an instruction on love and sacrifices. P. 61 The 1963 Octave Day of Christmas (January 1 is changed to "MARY, THE HOLY MOTHER OF GOD" for what other Baltimore Catechisms call the Feast of the Circumcision (of Jesus). P. 64 In two places the Catholic Book Publishing Company changed the Apostles' Creed prayer to say Holy Spirit rather than Holy Ghost. On the inside back cover the 2012 NSJFCC the term Extreme Unction is switched for the phrase Anointing of the Sick, and there are different book selections and a note at the bottom. The back cover has a different picture of the Holy Family. Rather than a portrait of them it shows St. Joseph working, Jesus helping him, and Mary sewing. Perhaps this is to reinforce the image of Saint Joseph as Worker. 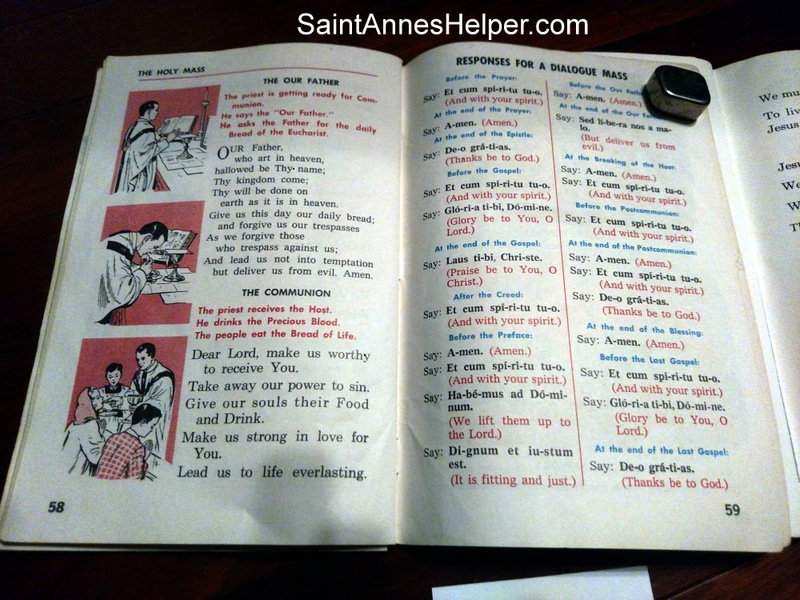 If you would like to see more about the Communion questions and answers for your Catholic Sunday school class, see our Saint Anne's Helper Catholic answers page here.